The location and profit center feature allows a company to use a GL segment to redirect a posting so that when a user logs in it automatically posts to the correct location or profit center. The location is selected as the user logs into Spire and everything will then be posted to that location. 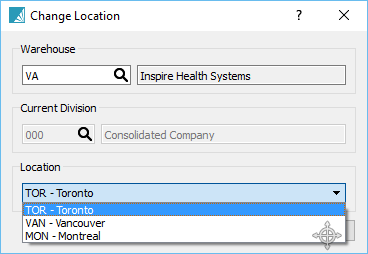 The user can change locations once in Spire by clicking the F10 key, as long as they have access to the other locations. The profit center is selected on each sales order. If it is not changed before posting an invoice the GL will post as default. If it is changed then the GL accounts that are set for that location will be used instead.